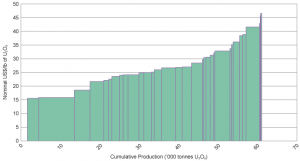 Uranium – Deep Value or Trap? The uranium spot price is down approximately 70% (since Jan 2011), with the bear market now in its 7th year. Uranium equities have been decimated over the same period. The number of miners has declined from 500 to 40. Fukushima – Japan’s nuclear disaster – in March 2011 was the catalyst for the start of this bear market. Despite this prolonged bear market and difficulty in predicting when uranium spot price will rise, at some point companies willing to sell product for US$22/lb which costs US$40/lb to produce will have to cease – the broader industry cannot be loss making into perpetuity. In our view, nuclear energy still has a future as a source of energy. In this report, we explore what signs may be appearing on the horizon which may indicate that the bear market may be nearing its end. These include contract renewals coming up, secondary supply should be pulling back, and significant supply required to meet future demand needs investment today – however no company is incentivised at current low prices to make the investment. 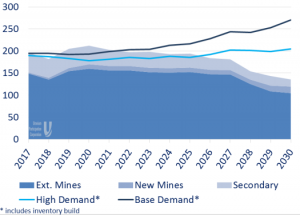 Key question – Will uranium prices trend up? It would be wrong to try to predict the exact time uranium markets could or will turn from their current bear market lows (assuming one still believes that uranium has a future). Instead, we put forward a case as to what could potentially trigger a recovery in the sector sooner rather than later. Clearly, selling uranium (or anything for that fact!) for a price of ~$22/lb when it costs you ~$40/lb to produce it, is just not sustainable. Here we look to develop the case why this was more sustainable (selling at a loss) in the past 6 years but unlikely to be going forward. The uranium industry entered its current bear market, now 7 years into it, after Fukushima in March 2011 (Japan Nuclear disaster). A 9.0 magnitude earthquake triggered a 10-metre high tsunami that crashed into the Fukushima Daiichi nuclear power station in 2011, causing multiple meltdowns. As a consequence, 54 reactors which provided approximately 30% of Japan’s electricity production were shut down. With 12 of these reactors permanently closed, 5 have restarted to date, and a further 21 reactors are in the process of achieving approval. As a result, the spot price for uranium has declined from US$72.50/lb in Jan 2011 to the current spot price of US$21.65/lb – representing a decline of approximately 70%. Uranium related companies and equities were decimated over this period, with the number of miners declining from around 500 to 40. The overwhelming response by most governments was to significantly increase regulatory and safety guidelines with respect to operating a nuclear power station. From our understanding, European countries (particularly France, Germany), but also the US and Japan, have been more willing or have plans to reduce the reliance on nuclear energy. While others remain in favour of nuclear energy playing some part in the future. Further, despite US’ stance, U.S President Donald Trump is in fact very much in favour of nuclear energy. Further, public sentiment, apart from a few developed countries (particularly Germany), towards nuclear is still balanced as a source of energy in the future. Despite the negative sentiment towards the sector as a consequence of these countries potentially pulling back on nuclear energy, it is worth highlighting that these particular countries contribute little to new capacity being built (under construction or planned). (2) renewable energy (e.g. wind and solar). In our view, the reliability and consistency are currently not available through renewable energy for it to step up in the medium term as base load supply. Further, fossil fuels carry the issue of higher emissions. Despite being one of the developed nations looking to pull back on nuclear energy, forward looking plans suggest demand out of the US will remain healthy. As at Feb 2018, the US has 99 operating reactors, 2 under construction, 14 planned and 21 proposed. 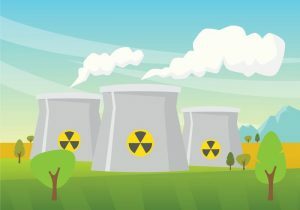 It is estimated that 20% of the US’ electrical energy comes from nuclear power (that is, 1 in every 5 homes = 23 million homes), with 62% of the nation’s carbon-free electricity. Therefore, switching is no easy task. According to World Nuclear Association, as at Feb-18 there are 448 operable civil nuclear reactors globally, with around another 57 under construction, 158 planned and 351 proposed. Most of the new capacity is being driven by emerging countries such as China and India. In China, there are currently 38 reactors in operation, with 20 under construction, 39 planned and 143 proposed. Depending on your time horizon, this equates to six to eight reactors being approved each year. UxC and UPS provided the chart below, which shows two demand scenarios over the medium to long-term. On their estimates, demand will exceed supply, unless new supply is incentivised (via higher prices) to come online. (2) supply (specifically uneconomical) is removed from the market (excess capacity diminishes). One of the drivers of a lower uranium price has been the slow pace with which the Japanese reactors, which were shut down post Fukushima, have come back online. As noted above, 54 reactors in Japan were shut down, with 12 permanently closed. However, to date only 5 have restarted and a further 21 reactors are in the process of achieving approval. This has meant that Japanese reactors have continued to receive inventory because of contractual terms, however were selling in the secondary market to recover costs. As many in the industry will note, this has been a significant source of pricing pressure in uranium markets. Most global commercial nuclear power reactors use uranium enriched in the U-235 isotope as their fuel. 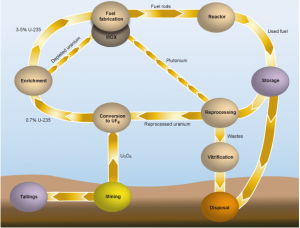 The Nuclear fuel cycle is provided in the figure below – as a rule of thumb it can take between 18 – 24 months from mining to utility. Natural uranium contains 0.7% U-235 and 99.3% U-238. In order to separate these, and enrich the percentage of U-235, the commercial process entails gaseous uranium in centrifuges. There are large commercial enrichment plants around the world and capacity of these plants is measured in terms of ‘separate work units’ (SWU). As the flow chart above indicates, utilities will buy uranium from the mines which will then be contracted to these plants to derive a fixed quantity of enriched uranium for fuel for their reactors. However, the enricher plants could be left with surplus natural uranium if the operational tails assay is lower than the contracted assay. In this case they sell the excess enrichment supply as alternative revenue source. This is referred to as underfeeding. What is important to understand here is that the enricher is motivated by plant economics (typically which is low cost) – that is the need to keep centrifuges running all year long even as demand for uranium came off. And so, lower demand resulted in these enrichers increasing their underfeeding to drive revenue and this significantly added to the secondary supply market. As the table below indicates, there is currently an oversupply of enrichment capacity – 58.6m units supply versus 47.3m units demand. Customers (e.g. large utilities) in the past have signed long-term contracts to shore up supply, as fuel is critical to running the plant. As the chart in the figure below highlights, there was a clear trend towards long-term contracts in the market from 2005 to 2012. It is generally noted that these contracts are around 7 years in tenure, which would suggest contracts signed in 2010-11 are coming off contract now. This means producers which had to supply uranium to meet contractual terms can now potentially take uneconomical production offline or pull back on future investments, until such time its economically viable. Given the state of the industry, there have been curtailments and under investment in the sector. We note recently Cameco announced the suspension of production at the world’s largest mine McArthur River. As we noted above, with long-term contracts now expiring, producers (no longer bound by contractual arrangements) lack incentive to produce at current prices. Also, in late 2017, Kazakhstan (the world’s largest uranium producing nation), cut its output forecast by 20% for the next three years. As a rule of thumb, it typically takes 7-10 years from beginning the application process to begin mining. With demand expected to increase and long lead time to bring supply online, uncontracted demand (with nuclear reactors required to shore up fuel normally a couple of years ahead), excess supply may quickly diminish in the spot market and prices could rise. According to UxC and UPS, there is approximately 21% of uncovered demand in 2020 and 65% in 2025. Whilst these customers have been taking advantage of the low spot prices in the market, the shift in the demand/supply equation could see a sharp price re-rating as long-term contracts roll-off. This major source of pricing pressure could ease going forward, in our view. As indicated above, the global enrichment capacity is in oversupply. 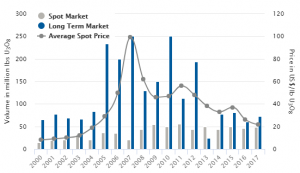 However existing contracts were based on much more attractive headline prices in previous years, the expiration and renegotiation of these contracts will be considered under the current low UX SWU spot price of US$37.00 per unit (from levels of around US$90 per unit). Further, with demand for uranium being on a decline, new product going through these enrichment plants will also have reduced and therefore excess supply inventory should be diminishing. We note one of the largest global enrichment companies Urenco in their 2016 results spoke about the excess capacity in the industry, which drove headline prices lower. As a result, Urenco is undertaking a €300m cash savings program to combat lower prices. This indicates lower prices are starting to pinch secondary supply as well. As noted above, there are 21 reactors in the process of achieving approval to come back online, with 5 already back. We suspect with these 21 reactors slowly making their way back online, inventory selling should reduce as these reactors will need to hold onto inventory for future use. Most inventories are held with the utilities. Global inventories held are estimated to be around 770 million pounds versus annual demand of approximately 183 million pounds. This equates to 4.4 years of demand, however China is estimated to be holding approximately 40% of this given the significant amount of growth estimated in its sector by 2030. 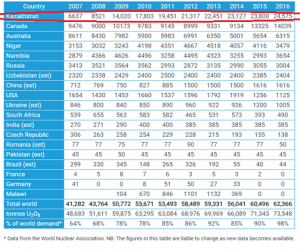 Excluding China, the rest of the nuclear world is holding approximately 2.9 years of supply. Historically utilities hold 2 to 3 years in inventory, with the fuel cycle estimated at around 2 years. The uranium production landscape has significantly changed since 2007, with Kazakhstan emerging as the global leader in uranium production. The Russian friendly region mines close to 40% of the world’s uranium (see figure below). Another perspective on the global production numbers is that Russia (or Russia friendly regions) effectively control approximately 50% of global uranium production (Kazakhstan, Russia, Uzbekistan and Ukraine). In which case relations with Russia could drive price in the short term. We have seen global tensions against Russia rise in recent times – US election meddling, Syria war, Crimea and the recently being accused of being behind the attempted murder of an ex Russian spy in the UK. Recently, we have seen several governments around the globe expel Russian diplomats including in the US, UK and Australia. Given US’ reducing production profile (figure below), most of the uranium loaded in US reactors is now imported (predominantly Canada 17 million pounds & Kazakhstan 11 million pounds). Should tensions rise and sanctions are put in place, the US could be required to go to the spot market or other producers. Depending on contractual arrangements, meeting US demand could be difficult. (2) The Company is due to decide on an IPO of its shares in the first half of 2018 calendar year. We would suspect, higher prices could only be positive for achieving a higher IPO valuation and price. In the past, companies typically achieved a premium of $10/lb above the spot price to supply uranium. In the figure below, we have provided the cost curve for global uranium miners in 2010, produced by CRU strategies. The curve indicates for 53,500t uranium p.a. production from mines in that year and for 56,200t uranium production in 2014, US$40/lb is marginal. Whilst the chart is a little dated, we believe the numbers are largely still relevant. We note at a conference in Abu Dhabi in April 2016, a representative from leading uranium pricing company Ux Consulting noted that the cost to produce uranium was approximately around US$39/lb. It’s early days but if this is the bottom there could be some oversized gains to be made for those that don’t mind adding a high risk stock to their Super Fund.